Thanks for stopping by. This is where I publish a lot of my features and thoughts on HF propagation, antennas and other ham radio topics. 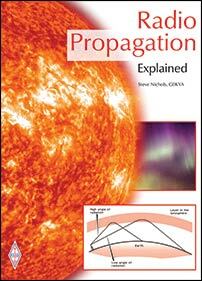 I write for a number of radio magazines, including the RSGB's RadCom and ARRL's QST. 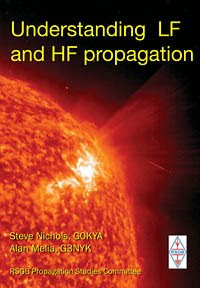 I am also chairman of the RSGB's Propagation Studies Committee and produce the weekly HF propagation report for GB2RS. When not playing radio I'm a professional journalist specialising in aerospace, science and technology and am also author of four RSGB books. Update: A detailed description and construction details are now available for download (PDF). I like half wave dipoles. They are easy to make and easy to set up. They also perform very well and usually beat a compromise antenna hands down. With 10m about to come alive again as solar cycle 24 gets going what I wanted was a low-angle efficient radiator that could be put up and down in a couple of minutes. My experience with ground plane verticals has been OK, but they are only as good as the earth beneath them. That is, they really need an extensive array of ground radials to work properly – not easy to put down when you are in a hurry. I also like to use fibreglass fishing poles as antenna supports. These are available cheaply (I have a 7m version and a 10m version that I bought from Sandpiper at the Leicester rally). The only problem is that they don’t have lateral strength – they are good for supporting verticals, but not so good for half-wave horizontal dipoles. What I really wanted to do was have a vertical half wave dipole, but the problem is that while the impedance at the centre of a dipole is about 50-75 Ohms, and very easy to match to coax, an end-fed half-wave has a very high impedance indeed, around 3000-4000 Ohms. If you just connect it to your coax or rig you will be disappointed. Enter the End fed Half Wave as featured in my "Stealth Antennas" book - download the PDF for full details. Update: now includes full construction details to download (PDF). I am working QRP on 20 with an "original" 1/2 wave end fed Zepp. It's working FB with open feeders. It's quite difficult and expensive nowadays to buy that stuff, and TV-ribbon is no where to find anymore. So I was planning to build a AA5TB design half wave with a polyvaricon. But your solution with a short piece of coax sounds better and cheaper I think. But do you use for the tuning coax just a piece of RG-58 with one side unconnected, thus leaving the other side complete open ?? and tuning by snipping a small piece at the time? I want to experiment with a T50- or T68-2 core. I have passed your link onto a pal of mine from our local radio club as he is building this antenna. The end-fed design is popular with a few of use round here due to it's very ease of feeding. Yes, the RG58 is left open at one end - I just cover it with PVC tape. You then snip it to tune. If you can't get a match less than 1:1.5 try spreading the turns out, removing a turn or adding a turn to the primary. 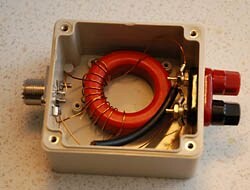 I have tried this type of antenna using a coil wound on a PVC white pipe form. Last but not least, it is ALWAYS a good idea to include a coil made of coaxial cable to act as an RF choke to prevent ¨antenna currents¨ from flowing on the outside of the coaxial cable shield. The End Fed Half Wave antenna described is a very good choice for those operators who have limited space and require an effective radiator. I have built a number of these on different bands and found the design extremely repeatable. Results are encouraging but tuning them up can get a bit fiddley. My solution to this is to use a small beehive capacitor in place of the coax capacitor and to date have expeineced on problems with 100 watts input. The Beehive does give the opportunity to try to tune the antenna without the cutting back of the coax then finding that you need to move the tapping point! The Antenna should by rights have the name of The G0KYA. A lot of good work with this antenna was carried out by Steve and by rights he should get all the credit.What you get is a cracking low angle radiator of low impact design, easy to put up and most importantly replicable. I built this antena for 10 meters using air wound inductors and toroids. Your toroid design resulted in improved tuning to the desired frequency. I used an air variable capacitor instead of coax. At SWR of 1.1, 50 ohm impedance, I still had some reactance. How do I tune this reactance to zero. If you are seeing a 1:1 match and 50Ohms I wouldn't worry about any residual reactance - it will work fine. The usual way to remove it is to add series inductance/capacitance depending on whether the reactance is capacitive/inductive. By all means try. but it might be easier to leave it! Put one together for 15 meters today. T-200 has 14 turns and 2 turn primary. Air variable at about 15Pf. Signals about 1 to 2 S points better than my Hustler HF-5-V and seems to get out better. SWR about 1.2:1, which is no problem. Excellent news - there are still some people who say it can't work! I do advocate adding a ground stake, four simple radials and a choke about 20ft back down the coax now. A lot of development work and practical experience has shown that this will get rid of any RF problems and prevent feedback when operating multiple stations for special events etc. If you are on your own, or just running QRP, as long as the coax runs along the ground RF doesn't appear to be a problem. Antenna is tuned to about 51MHz, being SWR 1.3 on band edges.I noticed the antenna is detuned about 500kHz when RG213 feed line is connected (why?) No TX testing because need a transverter or new rig. Sounds like it is using the feedline as part of the radiating system. This can happen if it is not earthed or the coax doesn't run alomg the ground (so it doesn't couple to earth). I would add 2-4 radials to the earthing point. Try 1-1.5m wire each radial, probably 1.4m best if using PVC coated wire. That might tame it. Hello , with all antennas , the material of the toroïd is very important . Note that the T200-2 has not a large bandwith , and is good chiefly for frequencies over 10 MHZ or more . Hi Steve, nice blog! For the 20/17/15m trapped version, what diameter former did you use for the traps? I'm building one on a 10m SOTA pole for my next trip to Vanuatu. I used 40mm white PVC pipe - the stuff you find in hardware stores for home plumbing. Thanks Steve, replicated your design and it works fine :-) Now working on a 30/20/17/15m version using the Sotabeams 100W traps. It all fits (just!) on the 10m Sotapole and will use your universal matching unit described above. I'll let you know how I get on. Been looking at this design for multibanding! Now think having an Fixed inductor & switched coax caps (RG174) will allow this with dedicated 1/2W trapped verts for 20/15, 17/10 & inductively loaded 40m. (Connect when want to operate on that band, ie one match box 3 separate selected wires Wonder if you tried this? have a look at my qrz page regarding an all band 7 mtr roach pole vertical.works for me dave g0ayd. You can view a chart for short-path HF propagation predictions for any band 80-10m and for any month using this link. Steve Nichols is an author, freelance journalist, photographer and communicator specialising in aerospace,science and technology. See www.infotechcomms.co.uk for more details. 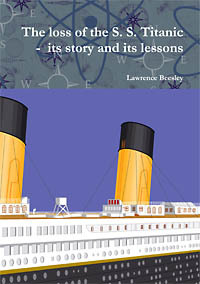 New e-book "Secrets of Stock Market Success"
New book - "The loss of the Titanic"